These are microcrystalline cellulose, sodium carboxymethylcellulose, dextrose, polysorbate 80, purified water and the preservatives benzalkonium chloride and phenylethylalcohol. Each bottle of Flixonase provides 150 sprays. Flixonase is used to prevent and treat seasonal allergic rhinitis (e.g. hayfever) and perennial rhinitis in adults and children aged 4 years and over. When you have rhinitis, the inside of your nose becomes swollen and itchy. This often occurs during the early summer when it is caused by breathing in pollens from grasses or trees and is called hayfever. Some people get problems all the year round and this is called perennial rhinitis. It is often due to house dust mites or animals such as cats or dogs. When you spray Flixonase into your nose, it helps to relieve the itching, sneezing and blocked or runny nose. 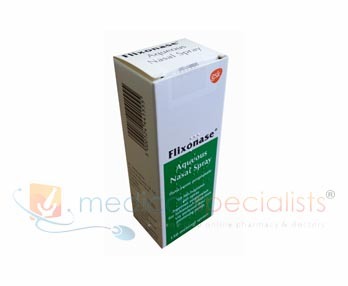 Where can I buy Flixonase Nasal Spray online? You can buy Flixonase Nasal Spray with or without a prescription at Medical Specialists, after completing a simple online consultation. Just complete an online consultation by clicking the orange button above. We are the UK’s leading online supplier of prescription medication in the UK and our pharmacy is regulated by the Royal Pharmaceutical Society of Great Britain. Most people do not have any problems after using this spray. If your nose or throat becomes painful or if you have a bad nose bleed after using the nasal spray, stop using your Flixonase spray and tell your doctor as soon as possible. irritation and/or dryness of the nose and throat. There have been very rare reports of a severe allergic reaction to this medicine. If you suddenly develop a rash, swelling (usually of the face, lips or tongue) or difficulty with your breathing, stop using your Flixonase spray and contact your doctor IMMEDIATELY. In very rare instances, treatment with some nasal corticosteroids may affect the normal production of steroids in the body. This is more likely to happen if high doses are being used over a long period of time. One of the rare effects is that children may grow more slowly than others. Children who are receiving treatment over a long period of time will have their height checked regularly by their doctor. Your doctor will help prevent this happening by prescribing the lowest dose of steroid at which your symptoms are wellcontrolled. If you feel unwell or have any other problems, tell your doctor and follow his or her advice. if you have recently been treated with injected steroids or if you have been taking oral steroids for a long time. Sometimes this medicine may not be suitable and your doctor may want to give you something different. if you are taking certain medicines used to treat fungal infections (e.g. ketoconazole). Check with your pharmacist or doctor if you are not sure. Make sure that your doctor knows what other medicines you are taking, including any you have bought from the chemist. Remember to take these medicines with you if you have to go into hospital.